Mililani's Glenelle Nitta did not beat the throw to Campbell third baseman Gerika Pantohan, who tagged Nitta out. Although two weeks remain in the Oahu Interscholastic Association softball regular season, postseason contenders are already in playoff mode. Yesterday's late-season showdown between two of the top softball teams in the state proved that point, as top-ranked Mililani scored the game's only run in the bottom of the seventh inning on an infield grounder to edge third-ranked Campbell 1-0 in a Red West game. "Campbell is a great team, one of the best in the West," Mililani head coach Rose Antonio said. "We knew they'd come in ready to play, they always do. This was like a playoff game, we could feel it. It's a good experience for the girls to play in this kind of game at this time of the year." In a contest fit for the state tournament, hurlers Makani Duhaylonsod and Brianne Patton locked up in an impressive pitchers' duel, matching zeros through six innings. Duhaylonsod went the distance in the win, scattering five hits and striking out five. Patton, who took advantage of a generous outside corner throughout the game, also allowed just five hits, striking out two. In all, the two pitchers faced 51 hitters, and the only free pass was an intentional walk by Patton in the top of the first. Mililani finally got to Patton in the bottom of the seventh when third baseman Celina Garces led off with a line-drive triple that squeezed inside the right-field line by mere inches. "She gave me a high, outside pitch and I went after it," Garces said. "Coach Rose told me to step up on the plate because she (Patton) was working away a lot. I was just hoping it would stay fair. It was right on the line. When I saw it was fair I made up my mind I was going to third." With the potential winning run at third and no outs, Campbell head coach David Perreira brought his infield in and the move paid off, as Rebecca Lee followed with a bouncer just to the right of Patton, which was cut off behind the pitcher's circle by Loreen Egdamin, who threw to first to record the first out while keeping Garces at third. Kristi Oshiro then slapped a roller to the right side of the infield that was fielded cleanly on the run, but the infielder's backhanded flip was errant, allowing Garces to stroll in from third. "That's how it goes," Perreira said. "The ball could've bounced the other way for us today, but it didn't. I'm happy with the way we played today -- we played as a team. Hopefully we can put it together the rest of the way and do something (special)." Campbell almost drew first blood in the top of the seventh, when the Sabers put runners in scoring position with two outs. After Duhaylonsod retired the first two batters of the inning, Katie Manuma and Chanel Baligaui came up with back-to-back singles. A gutsy two-out double steal gave the Sabers runners at second and third, with Brittany Garcia at the plate. But as she has throughout her high school career, Duhaylonsod responded, painting the outside corner to strike out Garcia looking to end the threat. With the win, defending OIA champion Mililani improves to 8-1 and retains its division lead. The Trojans look to avenge their only loss of the OIA season on Saturday against Leilehua at Central Oahu Regional Park before wrapping up their schedule with games against Kapolei and Aiea. Campbell will close its regular season with games against Waipahu, Leilehua and Pearl City before the league playoffs begin on April 30. Brianne Patton and Anuhea Yamaguchi. Makani Duhaylonsod and Rebecca Lee. W--Duhaylonsod. L--Patton. Leading hitters--Campbell: Leinna Kalua 2-3; Katie Manuma 2-3. 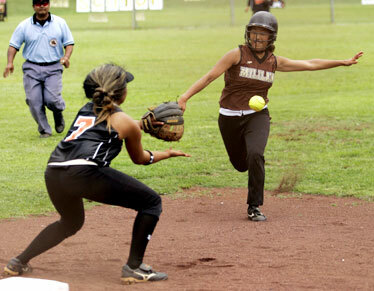 Mililani: Celina Garces 3b; Glenelle Nitta 2b; Jamie Aiwohi 2b. Amanda Vegas doubled in the bottom of the fourth inning to score two runs and lift the Surfriders over the Rough Riders. Leanna Bajarin and Kamalei Pitoi. Jaelleen Johnson and Johnna-Lynn Pedro. Leading hitters--Roosevelt: Bajarin 2b; Pitoi 2b. Kailua: Amanda Vegas 2b, 2 RBIs. Caira Pires scored the winning run on a passed ball in the bottom of the seventh as the Mustangs edged the Falcons in an error-plagued game at Aikahi Park. Chelsea Yamamoto, Kayla Kimura (7) and Kristi Belshe. Kara Holtzman, Caira Pires (1) and Hiilei Olson. W--Pires. L-- Kimura. Leading hitters--Kalani: Kyla Matsuoka 2-3. Kalaheo: Lili Cabral 2-4, Holtzman 2-3, Maglinti 2-3. Ryanne Dacosin hit a home run in the first inning to give the host Knights a head start in a victory over the Bulldogs. Ashley Kiaaina and Mikki Morihara. Maycee Moe and Kelsea Berinobis. W--Moe. L--Kiaaina. Leading hitters--Kaimuki: Genesis Texeira 3-3, 2b, RBI; Nina Atiga 3b; Morihara 2b. Castle: Ryanne Dacosin 2-3, HR, 2 RBIs; Moe 2-3; Kaitlynn Wills HR. Julie Brister and Kristen Campogan blasted home runs in a five-run fourth inning to power the host Mules. Lauren Fujisaki and Maya Nagata. Alex Smith and Chasea Crawford. W--Smith. L--Fujisaki. Leading hitters--Pearl City: Sanoe Aina 3-3, HR, 3 RBIs. Leilehua: Camey Narusawa 2-3, 2 RBIs; Julie Brister HR; Kristen Campogan HR, 2 RBIs. Dara Aiwohi-Dutro slapped a game-tying single in the bottom of the seventh and then scored on a passed ball to lead the host Marauders. Rayna Strom-Okimoto and Kori Nishi. Elsa Apo and Titi Felise-Laa. W--Apo. L--Okimoto. Leading hitters--Aiea: Emily Tausaga 3-4, RBI; Okimoto 2-4. Waipahu: Kari Sakamoto 2-4, 3b; Mahea Spencer 2-4, RBI; Apo 2-4, RBI; Dara Aiwohi-Dutro 3-4, RBI. Jessie Hathaway went 3-for-4, including a home run in the bottom of the sixth inning as the host Cougars defeated Na Koa. Nalani Kamano and Wewehi Ganeau. Jessie Hathaway and Chelsy Okuma. W--Hathaway. L--Kamano. Leading hitters--Anuenue: Kala Lewis 2-4, HR. Kaiser: Hathaway 3-4, HR, RBI; Okuma 2-4; Bailey Miller 3-4. Waianae 17, Radford 0, 5 inn. Tanisha Aniya struck out six batters and Chaelyn Manuel had three hits with a double and a three-run homer as the host Seariders dominated the Rams. Briana Salanoa, Erin Lauront (3) and Maryann Alofaituli. Tanisha Aniya and Chaelyn Manuel, Kamalani Ikau (4). W--Aniya. L--Salanoa. Leading hitters--Waianae: Aniya 2-2; Samantha Kuakini 2-3; Kiani Fuller 2-3, 2 2bs; Alexandria Soriano 2-3, 2b, 3 RBIs; Manuel 3-4, HR, 2b, 3 RBIs. Marissa Keao pitched a one-hitter and also hit a three-run homer in the third inning to lead the host Bulldogs. Sheila Aragayoso and Ola Suaava. Marissa Keao and Alyssiah Hernandez. W--Keao. L--Aragayoso. Leading hitters--Nanakuli: Camil Keawe 3b, 2 RBIs. Waialua: Keao 2-3, HR, 3 RBIs. Felicia Tui fanned 12 batters and hit a two-run double to left-center as the Govs pounded the Red Raiders at Hauula Park. Dalys Tapusoa, Josie Maiava (5) and Juleesa Kawaahau. Felicia Tui and Kincianna Ngiralmau. W--Tui. L--Tapusoa. Leading hitters--Kahuku: Kawaahau 2-4, 2b. Farrington: Amber Sales 2-4, RBI; Ngiralmau 2-2, 2b; Monique To 2-2, 2b, 2 RBIs; Tui 2-3, 2 RBIs; Seaana Kaapu-Napalou 1-3, 2 RBIs.